I would suggest getting it to add to your math reads. 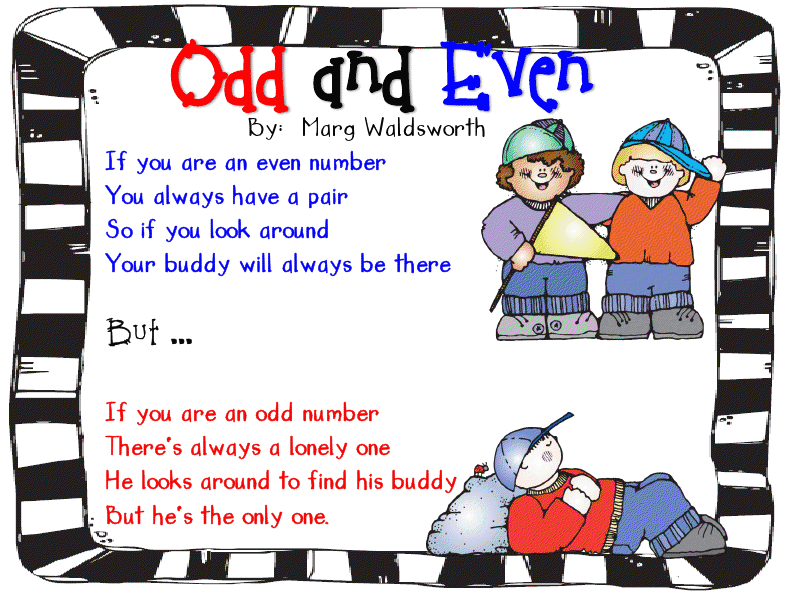 Following your reading, have the class play this Even Steven and Odd Todd game as created by First Grade A La Carte. The students pair up and decide who will be Steven and who will be Todd. They then take turns rolling a dice. If the number rolled is even, "Steven" moves their game piece towards the winner circle. If the number rolled is odd, then "Todd" moves their game piece towards the winner's circle. The first person to reach the winner spot...wins! Here's an Odd Todd and Even Steven video from You Tube that I am sure kids would enjoy singing along to! The activity that went along with these little guys was just as fun and cute as they look. For the example, Mrs. Carroll used candy corn, but any treat would be fine and hold the kids' attention I'm sure! 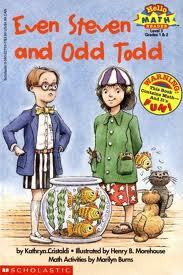 ;) First, you will need to explain to the students the difference between Todd and Steven. 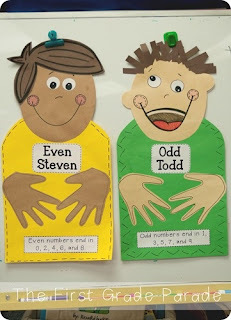 Odd Todd doesn't like to share and always has a different number of items in each hand (ie: 8 + 7 = 15), but Even Steven is super nice and always want things equal and fair with his friends. After going through this, she gave each student a pile of (uncounted) candy corn. With a partner, teams had to come up with whether the number of candy corn they had been given was an odd or even number. Please refer to the link above for a further explanation of the activity. Definitely something I will be using next year! 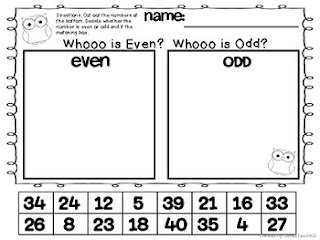 Step Into 2nd Grade with Mrs. Lemons has made up several FREE even and odd posters that would be perfect around the classroom! 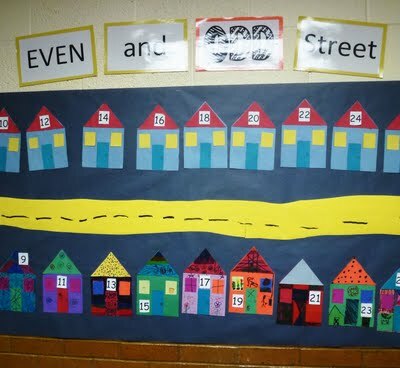 I love this bulletin board idea from The Teacher's Wife...Even and Odd Street. 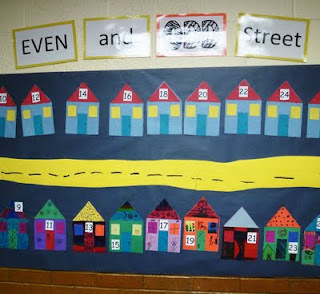 If you think it's an idea your students would love too, Lindsay has included a free template for the houses at the bottom of her post. Thank you Lindsey! I really like this activity from Stickers, Scissors and Smiles. 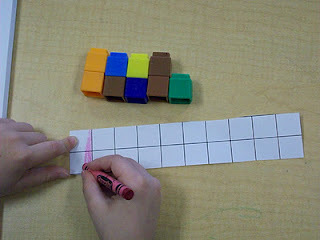 The students take a handful of unifix cubes and pair them up. 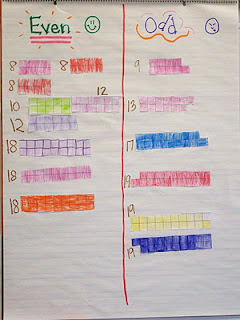 Then the kids draw their discoveries on a 20 grid paper like what's shown above. Then the students brought their drawings to the rug to share their discoveries and chart their findings. 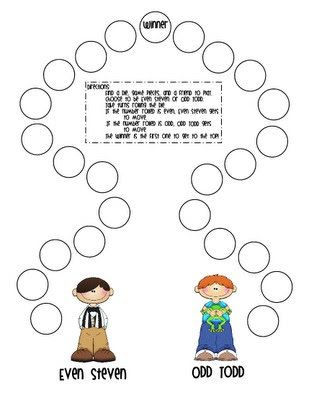 From Love2TeachKG, here is a FREEBIE on TpT. It is a 12 pages download including this reinforcement page. 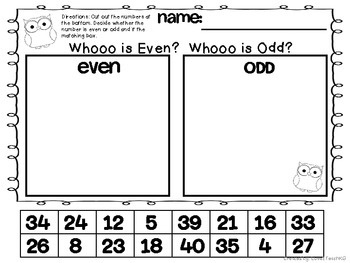 Here's a FREE Even & Odd Sort from Lauren and Jeanine's Creative Corner. Last idea on this subject, for now, is this one I came across on Two Can Do It. 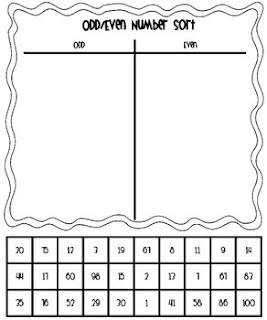 This is another FREE download so it would be super easy to print these pages out and store them away to use for a math station/center. The only thing I think I would add to this would be a recording sheet so the kids know they have some accountability. Other than that, I love the simplicity of this idea. The kids take dominoes and place them on the correct mat, depending on what they had. 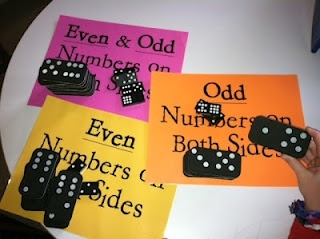 The mats read: EVEN & ODD (numbers on both sides), EVEN (numbers on both sides), or ODD (numbers on both sides). 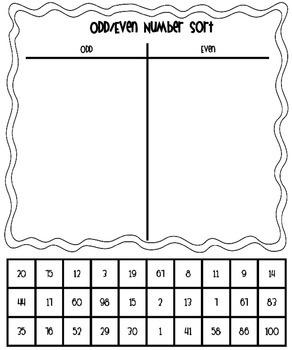 Here's a twist in the game Rock, Paper, Scissors to incorporate even and odd numbers. This is a two player game, one person is “odds” and the other is “evens.” Kids shake their fist, chant “1,2,3, shoot!” Then, they stick out zero, one, two, three, four, or five fingers. Kids find the sum of their fingers. If the answer is even, then evens gets a point. If it’s odd, odds gets a point. Source: E is for Explore! OK so there you have it. A few great ideas I have discovered that should help you get on your way to creating a more exciting Even vs. Odd numbers math lesson. I'd love to hear how some of these ideas turn out in your classroom, or better yet, if you have any other ideas to share! What great resources! Thanks for sharing! I was able to pick up some new ideas!